Between 1952 and 1974, MV Agusta riders won 38 world championships, including a run of 17 consecutive 500 GP championships by John Surtees, Gary Hocking, Mike Hailwood, Giacomo Agostini and Phil Read. In the late 1960s, Ago’s MV triples were so dominant that Honda actually abandoned the class altogether. Ironically, although Ago’s 500s were probably the world’s most famous motorcycles at that time, Meccanica Verghera had already moved on from motorcycles. In the early 1950s, Count Domenico Agusta formed an agreement with Bell Helicopters to produce the American company’s products under license for the European market. MV became a profitable helicopter company with a money-losing motorcycle subsidiary. However, the Count remained passionate about his motorcycle racing team; he was a two-wheeled counterpart to Enzo Ferrari. After he died in 1971, the racing team was brought to an end in 1975 and the entire motorcycle division closed in 1977. The MV Agusta factory used to be a seaplane factory. The company's aviation history is evident. Photo by Mark Gardiner. Agusta remained active in the helicopter business, but as a motorcycle brand it was moribund for decades. Then, in the early 1990s, Claudio Castiglioni (the founder of Cagiva and one-time owner of Ducati) announced that he had acquired the motorcycle trademark. After Castiglioni sold Ducati to the Texas Pacific Group in 1996, he doubled down on his plan to bring back MV Agusta. People were skeptical, but Castiglioni had already contracted with Ferrari for engineering assistance and hired Massimo Tamburini (designer of the iconic Ducati 916) to style the first modern MV Agusta. Tamburini created the first F4 750 in 1997. It was immediately acclaimed as one of the most beautiful motorcycles ever made. The bikes were certainly pretty, and pretty fast, but that and €1 will buy you a good espresso in Italy. Claudio Castiglioni, who died in 2011, is seen as a father figure by people at MV Agusta. Photo by Mark Gardiner. Claudio Castiglioni was not in very good health. His son, Giovanni, assumed control of the company in the early 2000s and fairly quickly brokered a sale to Harley-Davidson. It’s hard to believe now, but entering 2008, Harley was cash-rich and in acquisition mode. It bought the company in 2008 for $109 million. For a while, Giovanni Castiglioni continued to work for MV Agusta and reported to… current Harley CEO Matt Levatich! Harley’s dalliance with MV Agusta didn’t last long. The terms of Harley’s acquisition left Giovanni Castiglioni with a substantial credit — basically a promissory note — from Harley-Davidson. He told me that he used that credit to reacquire MV Agusta in 2010 because he feared that in the depths of the Great Recession Harley might simply close MV. Castiglioni invested another $20 million to complete the development of the 675 cc triple motor — a project that had been initiated by Levatich. For a few years, it seemed that Castiglioni had mastered the art of tacking into global economic headwinds. Then, in 2015, the company nearly foundered. Giovanni Castiglioni's grandfather founded Cagiva and his father resurrected MV Agusta in the 1990s. Now, he has to pull off another comeback. Photo by Mark Gardiner. Post-recession, MV Agusta pursued a strategy of becoming a “real” motorcycle company — maybe not with the scale or product range of a Honda or Yamaha, but nevertheless, MV aspired to offer a broad range of road models, including some at entry-level prices. Castiglioni’s next target was for MV to produce 15,000 units per year company, which he hoped would achieve some economies of scale. To do that, he struck a deal with Mercedes-Benz’s AMG division. Through AMG, the automaker invested about €20 million and promised a strategic alliance, in exchange for a 25 percent stake in MV Agusta. Around that time, Castiglioni became a target himself — of the Italian Guardia di Finanza. As reported by inSella.it, Castiglioni claimed to live in Switzerland for income tax purposes. Italian tax authorities said that he really lived on the Italian side of the border. At one point, they raided his home in Varese and took photos of the contents of the refrigerator, as evidence that he and his family really lived there. VareseNews.it also covered a separate tax investigation in which Castiglioni was accused of failing to forward the income tax deducted from MV Agusta employees’ paychecks. The Guardia seized some of his assets, including two Ferraris, and courts ultimately sentenced Castiglioni to a six-month prison term — which was promptly suspended. Awkward, eh? But back to the AMG deal. Castiglioni hoped to forge a real strategic alliance in which MV Agusta motorcycles would be displayed in Mercedes’ AMG dealerships around the world and MV Agusta and its dealer network would get access to Mercedes’ financing arm. Mercedes-Benz never took the relationship seriously. Maybe it was just a “me-too” thing; Audi had its relationship with Ducati and Mercedes sought a high-end Italian bike brand, too. 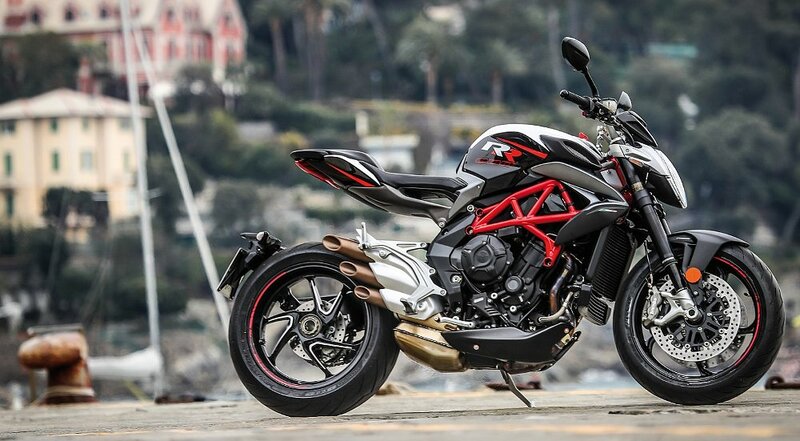 While the relationship between MV Agusta and AMG failed to get traction, the relationship between MV and its suppliers and dealers was really on the skids by the end of 2015. MV’s new relatively affordable models put the company in a price-sensitive market it was unused to. Buyers didn’t want to spend nearly €9,000 on a Brutale 675 when a Yamaha MT-09 cost less than €8,000. In hindsight, by the end of 2015, Giovanni Castiglioni had spent the last five years doing almost exactly what Harley-Davidson’s Matt Levatich had planned to do with MV Agusta. It hadn’t worked. Castiglioni went back into the Italian court system, filing for a concordata di continuità — similar to a Chapter 11 bankruptcy in the United States. The court allowed MV Agusta to restructure and it emerged with about half its previous debt. Castiglioni was able to recapitalize MV Agusta Motor Holding and repurchase AMG’s 25 percent of the company on favorable terms. Timur Sardarov said he did not want to be the kind of investor who is just seen once a year at board meetings. Photo by Mark Gardiner. The recapitalization of MV Agusta Motor Holding included a significant cash infusion from Timur Sardarov, through his Black Ocean investment company. Sardarov is a 35-year-old Russian who told me that he lives in London and commutes to Varese. His father, Rashid Sardarov, is one of the Russian oligarchs who made an initial fortune in the early 2000s when Eastern Bloc state assets were privatized. According to media accounts, the elder Sardarov was granted a concession to extract natural gas condensate and allowed to use a Gazprom refinery to refine the condensate into fuel. Since then, he’s built his own refineries and turned his companies, Comsar Energy Group and South Ural Industrial Company, into billion-dollar assets. Timur Sardarov studied economics at Moscow University. Everyone has a first job out of college; Sardarov’s was starting what amounts to a private airline, chartering aircraft and managing other people’s private jets. The private-jet business got a lot tougher after 2008. Around 2013, Sardarov bailed out, and made a series of mostly passive investments in new media companies. Around that time, a mutual friend suggested that Giovanni Castiglioni and his company could use some financial help. Sardarov wasn’t sure. He’d lived in Italy before and found it was a hard place for foreigners to do business. And he wondered how he’d be received as an outsider in a family business. He owned motorcycles, but he was a cruiser rider. It’s easy for me to imagine those two hitting it off. They’re both scions of rich and powerful families. With their sports cars, looks, accents, and urbane styles, either would be perfectly cast as the villain in a Bond movie. Sardarov spent 18 months doing due diligence before concluding what he described as “a very friendly transaction.” The size of Black Ocean’s investment has not been made public, although Castiglioni told me that his family trust retained 51 percent of the shares in MV Agusta Motor Holding and Sardarov’s company now owns 49 percent. 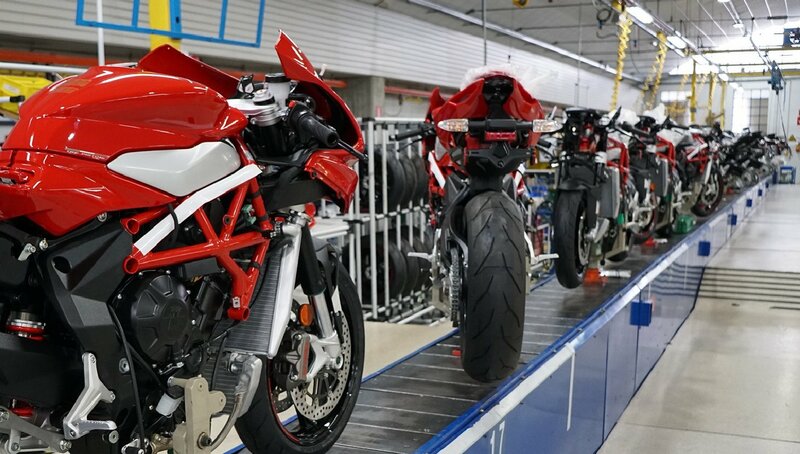 A motorcycle is dyno tested at the MV Agusta factory. Photo by Mark Gardiner. MV Agusta’s plans now call for volumes of 5,000 to 6,000 units in 2018. The company has essentially abandoned anything resembling an entry-level strategy. I was given pretty much free rein to explore the factory. Although the buildings themselves are quaint, the factory floor is clean and modern. The work force is reduced, compared to a few years ago, but MV is certainly producing motorcycles. Based both on what I saw and on a remarkably forthright presentation to journalists assembled for the recent Brutale 800 RR launch, I believe Giovanni Castiglioni and Brian Gillen (MV’s ex-pat American chief of R&D) when they say that MV’s largely resolved the quality-control problems that frustrated recent buyers, as well as the parts supply and inventory availability that strained the dealer network. A fuel tank is tested. Photo by Mark Gardiner. Models, manufacturing, and debt weren’t the only things rationalized during the restructuring; so was the dealer network. And there will be further consolidation, as fewer dealers work larger territories in the future. Castiglioni didn’t mince words when he admitted that American dealers were affected most by the parts and inventory problems. MV Agusta recently concluded a transaction with Urban Moto Group, an Australian(!) company which will replace MV Agusta USA LLC as the U.S. distributor. This year, they’ll focus on about 15 dealers, most of which are in New York and California. If you’re a motorcycle manufacturer, you really prefer the story to be about your motorcycles, not your finances. At the conclusion of their interviews, both Castiglioni and Sardarov were happy to close out our chats by talking about new bikes. If things go according to plan, the next big news out of MV Agusta will be a hyper-naked motorcycle, based on an all new 1,000 cc inline-four-cylinder motor. MV Agusta is charting a different course from major manufacturers that are increasingly focused on affordable, small-displacement motorcycles. They dropped a couple of other interesting hints, too. Already racing in World Superbike, MV Agusta will also be involved in Moto2 next year, when the class moves to a three-cylinder spec engine provided by Triumph. And the Cagiva brand is going to be resurrected. Castiglioni said a new electric model would be unveiled at EICMA in November and could enter production as early as 2019. It's rare to go to a motorcycle press launch and spend hours with company executives. It's even more rare to see a PowerPoint slide like this one. Photo by Mark Gardiner. As notable as all those things are, my most memorable moment in Varese was sitting in Castiglioni’s presentation to journalists and seeing an enormous Powerpoint slide come up with the headline, What Went Wrong. Not very many CEOs have the courage to even ask that question, much less answer it in public.